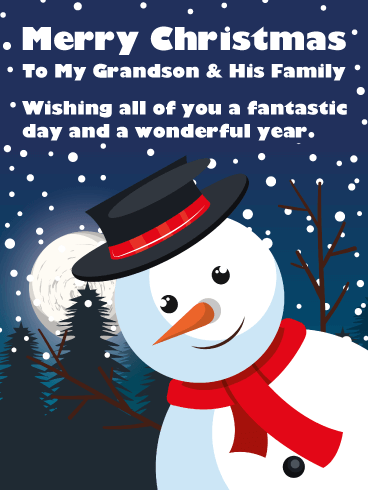 Send this cheerful and festive Christmas card over to your grandson and granddaughter-in-law, they will truly appreciate it! This wonderful holiday card displays perfect treats in the form of Christmas ornaments and a snowman. They look irresistible! 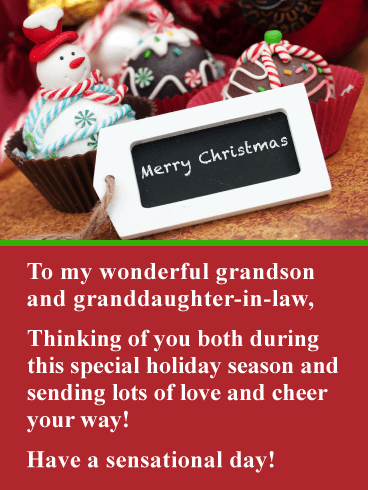 The message will let your grandson and granddaughter-in-law know you are thinking of them during this special holiday season. Be sure to send these holiday treats over to them soon before they are gone! This Christmas card was designed specifically for your grandson and granddaughter-in-law. It showcases an outstanding Christmas tree surrounded by snowflakes, candy canes and presents. It doesn’t get any better than this! 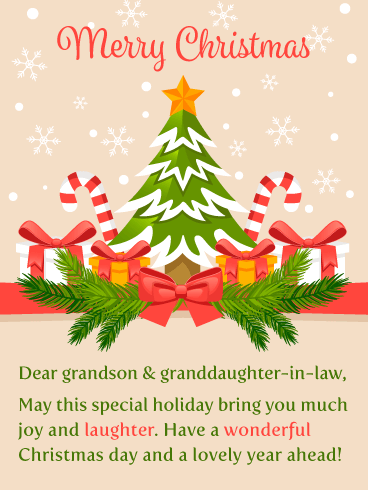 This Christmas card will allow you to wish your grandson and granddaughter-in-law much joy and laughter, as well as a Merry Christmas. Send this sensational holiday card out today so they will receive it in time for Christmas day. If you are looking for a thoughtful Christmas card to send to your grandson and granddaughter-in-law, then you have just found it! This holiday card will let them know that that you care about the both of them! 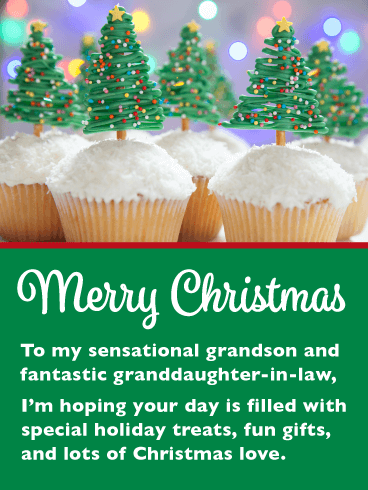 It showcases fantastic Christmas tree cupcakes that are decorated with colorful sprinkles. Very creative! The message expresses that you hope their holiday is filled with treats, presents, and of course, Christmas love. Your grandson and his family will be thrilled to receive such a yummy Christmas card such as this. It features the best Christmas cookies in the shape of a snowman, gingerbread house, stockings, and Christmas trees. Festive candy canes are also included, along with powdered sugar to give this scene a snowy winter look! They will be happy to read that you are wishing them the best day ever. 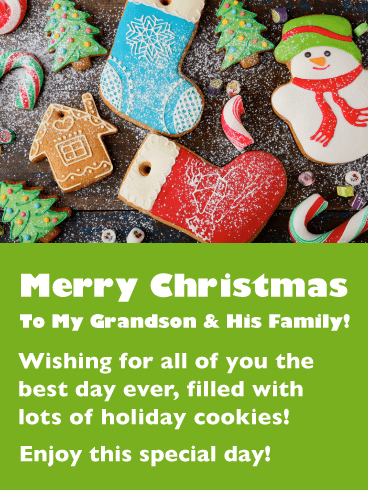 Send this Christmas card right away so your grandson and his family will be able to enjoy these cookies on Christmas day! 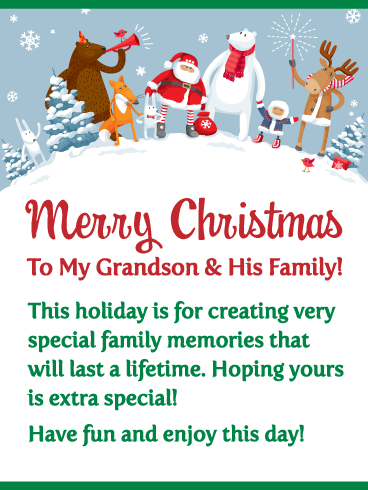 Send an adorable and meaningful Christmas card to your grandson and his family this year, they would love to hear from you! This charming holiday card has cute Christmas characters set in a winter wonderland! They will certainly think it’s the best! The message will remind them that this holiday is about creating special family memories, and that you hope theirs is extra special. Send this wonderful holiday card out today to put a smile on their faces this Christmas day!